A well-designed lab with innovative effective storage encourages learning. There are of course many challenges when it comes to staying organised throughout the school year. However, effective storage is a great tool to create a well ordered space. In this article, we will discuss six storage solutions tips to help you stay organised. Teaching walls can reduce clutter and create more spacious environments for practical activities. 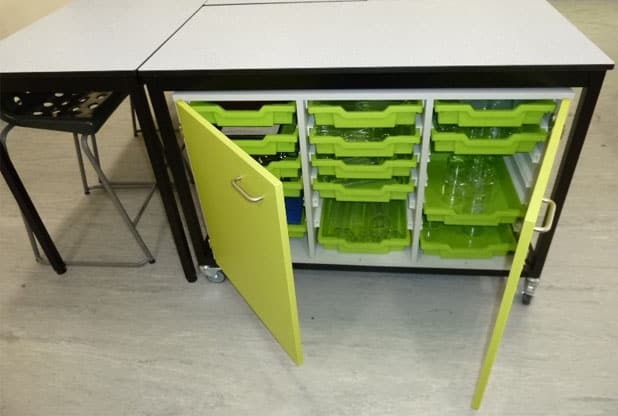 They are a good solution to underutilised space at the front of the classroom or lab allowing easy access to supplies and equipment during lesson time. 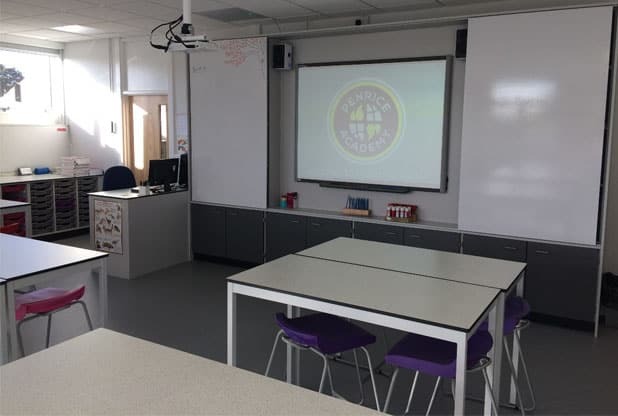 Teaching walls can accommodate a combination of tray storage, interactive whiteboards, pin boards and standard whiteboards. The main teaching wall also provides a focus point for students during lessons. 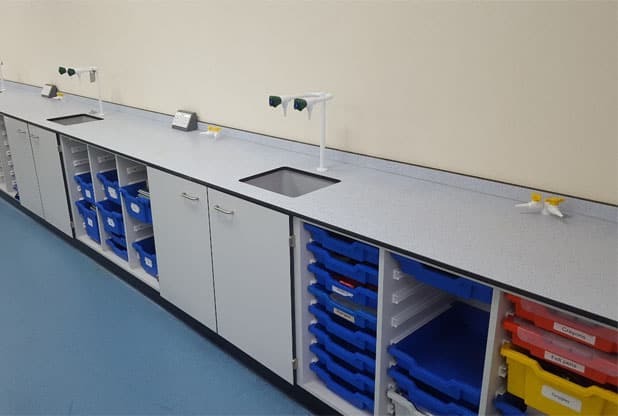 Free standing units that hold bags and coats are extremely important in school labs from a health and safety point of view. They allow for clutter to be kept away from the practical area to minimise the risk of accidents. 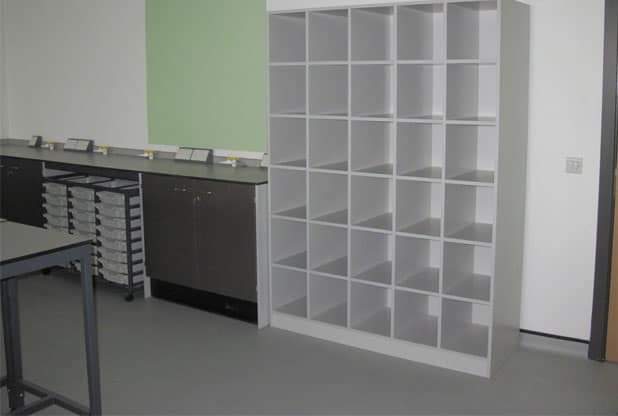 Shelving can also be used to store pupils’ personal items. It is important to make sure the shelves are large enough to hold all students’ items. It is possible to have a glass screen integrated into the teacher’s bench and the computer monitors can be placed behind this. This keeps the desk clear and organised and has the added benefit of preventing an obscured view from behind the computer screen. This allows for teachers to have a better view of the students to monitor behaviour. It may also help to position the teachers desk off centre so the whiteboard is not obscured, keeping sight lines clear. 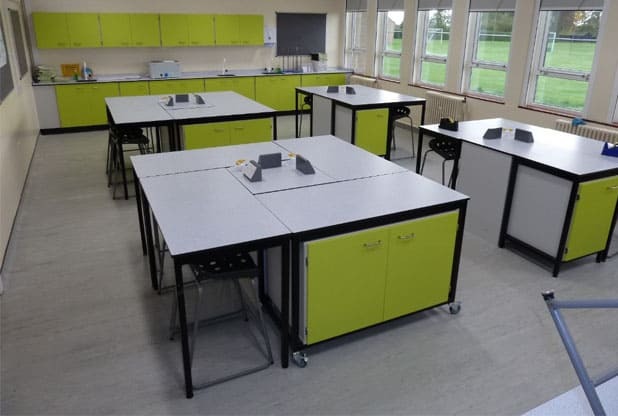 The design of the science laboratory at Rydale School allows for maximum storage whilst allowing all students to face the front for theory lessons and optimising the space available for practical lessons. Four desks are arranged around a service bollard. One of them is mobile and has a cupboard with tray storage inside. During theory lessons the three standard desks can be used so that all students can face the whiteboard and the teacher. 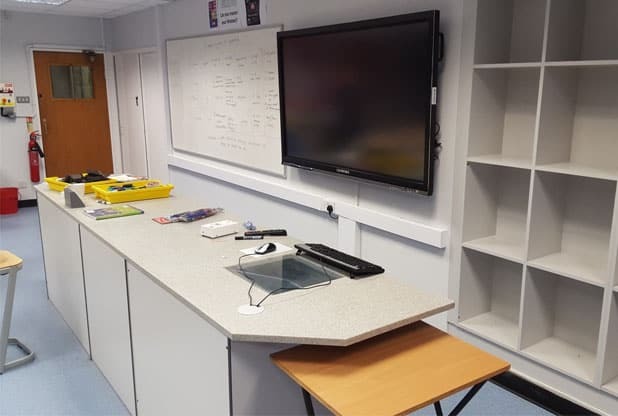 For practical lessons the students can spread themselves out using all four desks, including the worktop above the storage unit. This means the students can work in an uncluttered space and focus better on their lesson. 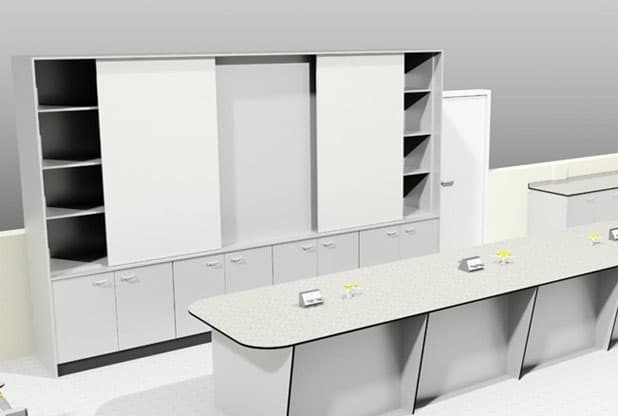 Sink lids are used to optimise desk space however they can clutter up the practical area when the sinks are in use. They are also quite heavy. 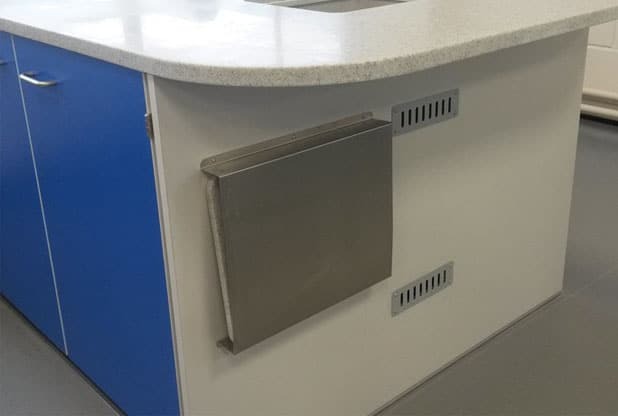 Klick designed a bespoke storage solution for Crosfields School. The stainless steel slot allows for quick and easy removal of the lids, avoiding breakages and accidents. Labels are key to staying organised and ensuring equipment is placed back correctly, keeping labs and prep rooms organised throughout the year. We have further details on our tray storage in our blog post ‘What a difference a Tray Makes.’ This post will show you how our clients use and label their own tray storage. Effective storage solutions are a specialist area for us at Klick. We love a tricky storage challenge and with over 35 years experience creating storage solutions we will find the best solution for you. Please contact us on 0161 998 9726 or email us at sales@klicktechnology.co.uk we would be very happy to help.